Tiny organisms that covered the planet more than 250 million years ago appear to be a species of ancient fungus that thrived in dead wood, according to new research published in the journal Geology. The researchers behind the study, from Imperial College London and other universities in the UK, USA and The Netherlands, believe that the organisms were able to thrive during this period because the world's forests had been wiped out. This would explain how the organisms, which are known as Reduviasporonites, were able to proliferate across the planet. Researchers had previously been unsure as to whether Reduviasporonites were a type of fungus or algae. 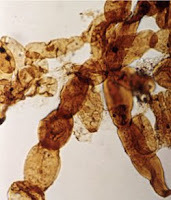 By analysing the carbon and nitrogen content of the fossilised remains of the microscopic organisms, the scientists identified them as a type of wood-rotting fungus that would have lived inside dead trees. Fossil records of Reduviasporonites reveal chains of microscopic cells and reflect an organism that lived during the Permian-Triassic period, before the dinosaurs, when the Earth had one giant continent called Pangaea. Geological records show that the Earth experienced a global catastrophe during this period. Basalt lava flows were unleashed on the continent from a location centred on what is present day Siberia. Up to 96 per cent of all marine species and 70 per cent of land species became extinct. Traditionally, scientists had thought that land plants weathered the catastrophe without much loss. Today's findings suggest that much of the vegetation on Pangaea did not survive and that the world's forests were wiped out, according to the researchers. Geological records show that there was a massive spike in the population of Reduviasporonites across Pangea as the Permian period came to an end. The scientists suggest that this means that there was in increase in the supply of wood for them to decay. "Our study shows that neither plant nor animal life escaped the impact of this global catastrophe. Ironically, the worst imaginable conditions for plant and animal species provided the best possible conditions for the fungi to flourish." The team suggest that the basalt lava, which flowed during Permian-Triassic catastrophe, unleashed toxic gases into the air. The gases had a dual effect, producing acid rain and depleting the ozone layer. The outcome was the destruction of forests, providing enough rotting vegetation to nourish Reduviasporonites so that they could proliferate across Pangaea. The team reached their conclusions by analysing the carbon and nitrogen content of Reduviasporonites using a High Sensitivity Mass Spectrometer and comparing the results with those from modern fungi. They discovered that Reduviasporonites and modern fungi show similar chemical characteristics. In the future, the team plan to carry out further comparisons between Reduviasporonites and potential counterparts among modern fungi, which they hope will provide further clues about how Reduviasporonites lived.